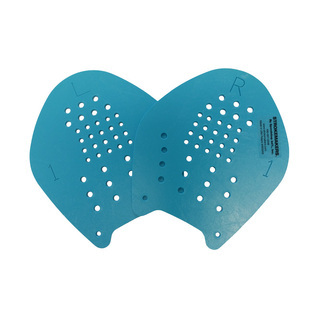 These swim paddles were engineered to improve your swimming stroke while limiting stress on your shoulders. Important Note: These paddles are now being manufactured in new colors and with a slightly different yet still flexible plastic. They will work just the same as the old material and colors. Currently we only have the size 1 in the new style, but more will be here soon! Being an oldschool swimmer, this model is a must have. Have been using it for my whole career, from age groups to masters. Simple and works. The only downside is that they are becoming expensive. However, it is durable. I purchased the small azure blue paddles which I found to be too small, almost the size of my hand, so I would consider sizing up depending on your needs. The paddles perform well though and have plenty of adjustment points. I had to cut the elastic myself which I thought was a cheap move. They're sturdy and seem like good quality, a lot of people like them in online reviews. They do what they're supposed to as far as increasing resistance but I'm not sure they actually correct your stroke. I'd need someone else's input to evaluate that. They had good durability and lasted about 3 years for me before cracking between the holes. I plan to buy them again. I purchased the #1 green paddles. Perfect size for a full size adult hand. These paddles are all you need, two simple tube straps are very easy to adjust but hold the paddles firmly in place.